Museum of Ice Cream 2.0 launched recently in San Francisco, friends! is introducing the next generation product, MOIC 2.0 featuring a newly reimagined experience including their largest Sprinkle Pool to date (4x the size), new installations, limited-run shows, brand new ice cream tastings, and a free and publicly accessible cafe and shop that will make foodies melt!! The MOIC movement has spread across the globe. Having employed over 1,000 millennials, their #TEAMMOIC, experiences, products, and mission have reached every city in America and touched over 80 countries. Since launching in 2016, ice cream has remained the power force behind uniting communities, fulfilling the real meaning of MOIC: "Movement Of Imagination and Connection." They are on a mission to unite the world through its universal love of ice cream. Why San Francisco?, You ask. Well, let’s just say it sold 500,000 tickets over its first year. MOIC decided that its iconic location in the historic bank building in downtown San Francisco would be its first permanent flagship. A first ever, limited-run immersive experience "Sprinkle Spectacular" is running now through May 27, their new characters will lead guests on an adventure through the Museum, ending in the world's largest sprinkle pool party! See you at MOIC San Francisco? I’m really thinking about returning for more photo sessions before the boys grow up and refuse to be dressed in pink and mint colors! A Pop of Color & Good Times! Yay to Bread Bowls, Balloons and Beignets! Sometimes it’s better to show good times than to write about them, right friends? For that, I thank the mighty iPhone camera which captured many awesome memories from our February 2019 trip to San Francisco. We actually didn’t overbook ourselves with museum outings and exploration journeys. Instead we thoroughly enjoyed our time exploring few locations. Those included Chinatown, Fishermen’s Wharf and the Shipyard area of the city where my sister Irene’s fabulous apartment is located. Here are our 21 favorite moments from our most recent trip to the city. 4. Finding small outdoor chairs to take in the sun. The only condition was that they smile for the camera in front of the signature Ben & Jerry’s Cow logo (because it included a picture of San Francisco’s Golden Gate Bridge). We ended up sharing a single scoop of their Cherry Garcia flavor. Toby wanted Cookie Monster. Benny wanted an Octopus with pink tentacles. Both boys won the affection of the balloon maker and got free green swords in addition to their large balloons. 8. Refusing to leave the bench after winning a sword fight. The boys had many balloon sword fights that often ended in passers-by getting a bit annoyed. Then we decided it was time to go but Toby didn’t want to step down from his pedestal. The balloons turned into the biggest inconvenience of the day. And every time cookie monster lost a limb, Toby would cry harder. This super cool restaurant is located across the street from the world-famous Boudin. But crossing the street to stand in a long line with two boys and four large balloons was a bit much so we opted for convenience and ate at the Franciscan Crab House. No regrets there. This was honestly soooo delish. The boys didn’t eat fish (Benny has a shellfish allergy), we ordered “Chicken & Chips” for them which were very good. Ok. Maybe they overdid it with the powdered sugar. But these were awesome. We shared an order of three beignets and enjoyed them a lot. Just think of a huge arcade with nothing but antique games (which are all coin operated). This was probably more enjoyable for Paul and I but the boys had a blast… See below to learn why. This is kinda freaky and kind of amazing all at once. The puppet lady (left) moves and sings a haunting tune which probably would give me chills and nightmares in the dark. Benny didn’t quite grasp the concept but he tried winning the match. It was too fun to watch. 15. Being declared a “LOVABLE” person after paying $0.50 to sit on the Throne of Love. I mean, I coulda’ told you that about me (lol)…. but it’s always nice when a mysterious chair says it. Perhaps, the heavier the person, the nicer the results? The music, the dance moves, the craftsmanship to create these puppets… it’s all too great. This place has plenty of food trucks, a booze booth, games for the kids and an area to reserve your own swinging chairs around a bonfire where you’re provided with all the ingredients to make a one-of-a-kind S’mores creation. The couple who had reserved the private area to enjoy swinging chairs around a bonfire said yes to letting Benny have a marshmallow. In turn, Benny invited his newfound friends to enjoy marshmallows too. He assumed of course, that if the couple had allowed him to eat, they would be okay having an additional three kids mooch off their sweet treats. 20. Toby deciding he didn’t want to sit with us. Instead, he spent time crawling in and out of a tented table area. And interrupting us frequently so we could wave back at him. She was so gracious about it. True story— in a span of three days, the boys slid down one of her living room walls, jumped on top of her microwave (don’t ask), one of the boys threw up on her gorgeous bed throw (it happens), they ate all her snacks, marked greasy hand prints on her dining room chairs and well, many more things… Thanks for being a great host, Irenee! Love you. by the time we returned home from our trip. But it was worth it. Here’s a blog post where I explain why it’s worth the hassle to travel with little kids. Benny & Toby boarding a plane in Burbank! Let me keep it real, friends— A weekend getaway with my family generally means a lot of chasing after boys, messy and hyper hotel nights, running late to reservations plus a major test to our patience. That’s because when we’re on ‘travel mode’ Paul and I have to manage the stress that comes with crises such as losing a toddler shoe and realizing it only after getting through airport security or managing fights that started because the younger kid got more M&Ms, or fixing diaper blowouts in a dirty public restroom in a shady part of an unfamiliar town, or the inevitable interruption of routine that includes a lack of necessary naps and downtime for the boys. Our Presidents Day weekend trip to San Francisco was no different. Traveling with kids is SO. MUCH. WORK! is that somewhere along the dreaded experience of getting through long lines at the airport and figuring out dinner for hungry and picky little palates, we really bond as a family unit. While we’re suddenly immersed in a world of unknowns one thing we do know is that we have each other no matter where we are— which is a very powerful energy to carry around, friends! The unique feeling of as-long-as-we’re-together-everything-will-be-okay, reaches level 1,000,000 and that’s when you realize Family. Is. Everything. the hilarious things that happened and laughs we had are very much part of our memories now. 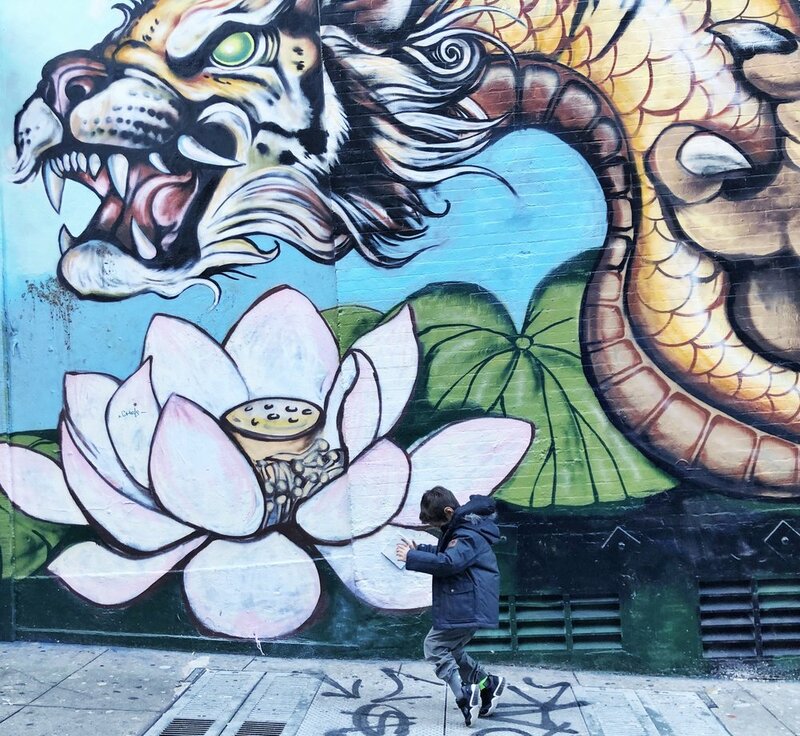 Plus, the diversity of cultures, people, food and experiences we encountered in San Francisco helped our kids learn more about the world we live in. to what’s comfortable, familiar and safe is always easier, it’s also good to take a leap of faith in the name of giving our kids new things to learn, experience and enjoy. That’s not saying I could handle doing this several times a month or anything like that— my goodness, just the packing and unpacking alone is a humongous task. What I’m saying is that traveling with kids can be a lot fun. Remember that in these days of fast communications and problem solving technology— there’s nothing you can’t fix while out of town. Yes, you’ll be tired and perhaps a little grouchy at the end of each day… but not without having seen your kids laugh and thrive in an environment that’s not their own. That’s my two cents. Benny enjoys a tour of the cockpit with a special opportunity to take the Captain’s seat. The captain even lent his hat for a photo-op! 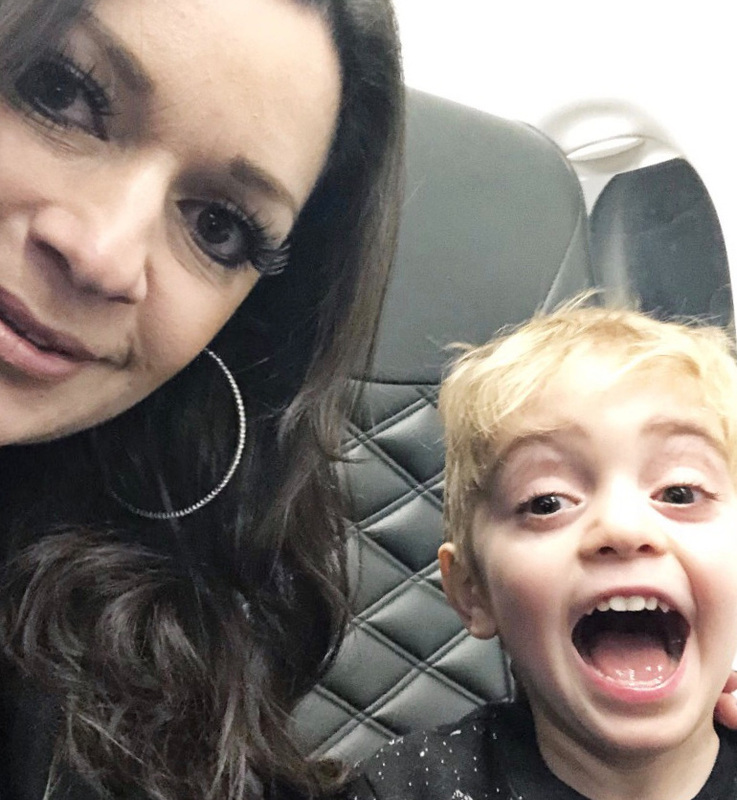 Click here for funny stories and good memories of our February 2019 trip to San Francisco. A Trip to Mexico City certainly wouldn’t have been complete without our fix of magical Indigenous history. Our dear cousin Gabi, aunt Rosi, uncle Mace and goddaughter Monse picked us up and drove us to Teotihuacan, land of the Majestic Pyramids of the Sun and Moon. Teotihuacan is located about 30 miles Northeast of Mexico City. For this journey, we booked a tour guide who walked us through some of the ancient history and shared incredible stories that helped us begin to understand how a civilization without technology as we know it today— could have built such a sophisticated system with urban and economic structures. by a civilization of people that ultimately abandoned it. Nobody really knows why the Teotihuacanos left such an incredible place they had created from scratch. All we know is that 1,000 years later, the Aztecs discovered this ancient city and basically moved in! They turned it into the powerful Aztec Empire we’ve heard about and admired…A place where people thrived and also where many spiritual ceremonies of worship and sacrifice took place. it was a Sunday afternoon which meant it was an extremely busy day. Locals get in free on Sundays, the weather was warm and inviting and dozens of tourist buses could be seen lining up near the entrance. Our wait time to climb to the top of the pyramid was two hours. We decided to only climb halfway. That would give us time to explore more areas and enjoy a nice local meal. we headed to a nearby restaurant where we savored the likes of enchiladas, tostadas and Ranchera BBQ cuts with sides of rice, beans and salsa. My uncle also ordered a speciality dish called Escamoles. These are ant larvae (eggs). To be honest, I wasn’t feeling the dish but I also didn’t want to feel like I skipped on an opportunity to taste a local delicacy. So I went for it. I’ll just say I probably won’t order Escamoles on my next trip to Mexico City but at least they’re off the bucket list! we woke up with MAJOR sunburns. Nobody warned us that the bright sun shining down over Teotihuacan would be so powerful… wow! Note to self: Don’t forget the suncreen next time. Fortunately, we were in Mexico so getting a hold of some fresh aloe vera was not a problem. Overall, our Mexico City trip was fantastic. Ok, I may have gained a few pounds (again) but every culinary, cultural, musical and life experience in Mexico City was well worth it! This trip only happened because I attended the 2018 We All Grow Latina Summit where Delta Airlines was a sponsor offering first-class rountrip airfare as raffle prizes. Por sus atenciones y productos, oportunidades, muchísimas gracias We All Grow Latina Network y Gracias Delta Airlines. Por tu magia y encantadora historia y cultura, ¡gracias México! thanks for joining me, hermanita! Thanks for following along our first class adventure and travel journey, friends! a) We used Uber for all our transportation needs, which was very affordable and convenient. c) We did NOT have small children to watch (the kids stayed home with Paul). Small shrines in honor of Mexico’s Patron Saint, The Virgin Mary of Guadalupe can be found throughout Mexico City’s neighborhoods, regardless of the colonia’s socioeconomic status. We started off with a light breakfast at super fun restaurant called Lalo! Think of a hipster, colorful and crowded cafeteria style place with Mexican food options for breakfast like chilaquiles and huevos rancheros or simple a la carte selections like pastries and coffee (which is what we did). It’s located in Downtown Mexico City (centro). The Museum of Women is rather small (a two-story historic building with about half a dozen small exhibit rooms) but it does a great job explaining how the women’s civil rights movement came to fruition in Mexico. For this museum, I recommend a lot of time to read through the many historical descriptions. There aren’t many photo ops at this museum and there’s definitely more to read than see. Still, a fantastic opportunity to enrich your Mexican girl power knowledge. The Mercado Artesanal La Ciudadela is an arts and crafts market that’s very safe, clean and features beautiful Mexican gifts and mementos— from handmade copper jewelry and Luchador masks, to furniture, pottery and leather goods. It’s really incredible. The park seemed to be hosting a type of outdoor ballroom dancing event. We walked towards it and discovered a full-blown dancing fest. Turns out, every Saturday hundreds gather at La Plaza de a Ciudadela to dance to the tunes of Danzón, a genre of music from Cuba made popular in Mexico in the 30s and 40s. It that has hints of Rumba, Son and Cha-cha-cha. As you could imagine, the music got me and before I knew it, I was dancing with a friendly 80-year old man! We headed to el Mercado de San Juan Gourmet for a bite or two. But upon discovering this ginormous market, we decided we wouldn’t eat there, but rather explore the many offerings each vendor presented. We found skinned rabbits, chocolate covered scorpions, deer meat, crocodile sausage and a bunch of other rare foods. We limited our palates to trying fruit from several stands— mmmm, the figs and berries were the best! We headed back to the area where we were staying and decided to explore Mercado Roma. At Mercado Roma, we found an indoor gourmet food court with amazing options. Still, we couldn’t escape our craving for tacos. We went for tacos and beer. Our order came with three tacos and a Coronita… yum! Afterwards, we enjoyed a delicious churro from El Moro, which has been a landmark in the Roma area since 1935. We arrived back at our AirBnB apartment, took some time to relax and headed out to Mexico’s historic center for a drink at a bar called Xamán. Coyoacan is a popular area of Mexico City mostly known for being the home of famed artists Frida Kahlo and Diego Rivera. At the center of Coyoacan is a popular plaza with restaurants, bars and live entertainment. There is also a two-story marketplace with Mexican crafts, clothing, toys and candy. To end the night, we dined at Cantina La Coyoacana. The restaurant offers a Mexican menu, an impressive tequila menu and a lively mariachi on weekends. Warning: The wait to dine here can be long. We waited for about an hour before getting seated… but it was totally worth it! The Molcajete we ordered arrived with plenty of cuts, chicharrón, cheese, grilled onions, hot sauce and tortillas to make it a most unforgettable dinner…. And that’s how we concluded Day One of our Mexico City Adventures! Kindly CLICK HERE to read about our Day Two adventures! Friends, every now and then I get lucky with amazing opportunities. I blame it the law of universal attraction and maybe a little bit of pixie dust. Last Spring, I attended the incredible We All Grow Summit, a conference created by Bossmom Ana Flores for Latina influencers and content creators (currently listed as one of the best conferences for women by Forbes). and they had a really cool activation where conference attendees were able to learn more about the airline, its many flight features and even network with the airline’s PR reps. Before leaving the suite, guests had a chance to win a number of prizes by spinning a fun prize wheel. When my sister Frances spun the wheel, she got a free Starbucks gift card (she was happy). When I spun the wheel, I learned I would be entered into a separate raffle for a chance to win first-class, round trip tickets to one of many destinations. Low and behold, a few weeks later, I received news that I’d won the raffle prize trip to Mexico City! and we arrived at LAX ready to embark on an adventure to Mexico City, a place we hold dear to our hearts because that’s where my mom is from. We’ve been visiting the Mexican Capitol (previously known as ‘El D.F.’) since we were little girls and there’s always so much to do and see! To start the journey, we learned that with our First-class tickets, we’d have access to Delta Airline’s Sky Club, located on the 4th floor of Terminal 2 at LAX. The selfie game turns up a notch when I’m on vacay mode!!! for Sky Priority Members (generally first class passengers and folks who’ve racked up a lot of Delta Sky points). The Sky Club is a great place to work, rest, wine and dine! Passengers can enjoy this area before it’s time to board the plane at their respective gates. Hot and cold food buffets, snacks, free publications like the L.A. Times and an open bar. Cheers, friends! Once aboard the plane (we actually flew on an Aeromexico flight operated by Delta), we were thrilled to be seated at the very front row! very ample seats, a really nice meal and a wide selection of drinks (including alcoholic beverages). Even though WiFi was not included on this particular flight, the airline’s internet service, GoGoFlight was very reasonably priced. Overall, the 3-hour flight was smooth, except for maybe about 15 minutes of turbulence. I took a short nap and before I knew it, we were descending! getting to our luggage was easy since it was marked with a yellow “priority” tag. For this trip, we ordered a private car company to pick us up from the airport. We figured, if Delta had given us this unique opportunity to fly first class, might as well make it an all-around first-class adventure! The Mexico City Airport has these huge colorful pots decorating many of the general areas! which includes photos of our excursions, meals, tours, friends, art and cultural experiences, CLICK HERE! Thanks for reading friends and thank you, Delta and We All Grow Latina for allowing these Latina sisters to visit our mami’s hometown! Friends, I went on a mini vacation with my husband and upon arriving, the man I’ve been married to for eleven years suddenly became my boyfriend again… Awwww. Paul and I were due for a getaway. We needed to take a few days to reconnect and escape the many stressful factors that accompany demanding jobs, small children, general adult responsibilities and the ridiculously fast-paced Los Angeles life. My sister and parents agreed to take care of the boys and off we went. When we found ourselves inside a gorgeous tropical paradise with piña coladas awaiting— after having sat next to each other, laughed and flirted a little on the plane — we knew we had made the right decision to leave everything on hold and focus on each other. It took a little adjusting because, let’s face it, we’re used to disagreeing here and there, but once we arrived, I felt like his girlfriend again… it was so perfect! own a timeshare at the Vidanta Resort in Puerto Vallarta and they invited us to travel and enjoy the many indulgences of this extraordinary complex of hotels, restaurants, shops, bars and swimming attractions. We stayed at the Grand Mayan Hotel within the Vidanta Resort. soaking pool in our private terrace, a huge bathtub and a spacious kitchenette. Not too far was a fantastic “Shark” Bar; a Cantina-style restaurant that served steak Chicharrones (to die for) and held a nightly water show. In our building we had an arts & crafts room where guests could learn to make Mexican artwork (or pose for pictures like me…lol). raccoons and hawks in a tropical jungle setting that featured a lazy river, numerous beautifully designed pools with a view of the ocean, gorgeous shows and lively nightly entertainment. the ambiance was perfect and even though we missed our boys on Halloween night, we enjoyed taking the time to remind each other why we got married to begin with… he’s my better half! Getting away from everything was necessary and something I recommend to all married couples. The Vidanta Resort is beautiful, friends. Reservations for non-members start at approximately $700/night for a one-bedroom suite at the Grand Mayan. A brand-new, state-of-the-art Cirque du Soleil Theme Park is currently under construction and the first phase will be inaugurated in 2020…. I can’t wait to return! We had a blast. Love you guys! Lovin' Life at Laughlin During Labor Day Weekend! Fun in the Desert Sun! Nothing beats getting away for a weekend without going too far. What I mean by that is–– while we'd be thrilled to visit Tokyo and Sao Paolo and Oahu, a vacation with kids is, well, hardly a vacation for mom and dad. It's a lot of work and stress and round-the-clock snack requests and bathroom trips and while seeing the little smiles on their faces makes it all worth it, returning home usually calls for another vacation just to give us a chance to decompress! We've ventured on several international trips with Benny but when Toby arrived we decided to keep things muuuuuuuch simpler and hassle-free. a dream vacation means a road trip to San Francisco, where we make multiple stops along the way; or a train ride to San Diego where we end up at the Marina and enjoy arcade time and ice cream cones. Most recently, we were invited to hang out in Laughlin, Nevada, with some good friends who own a home & a boat near the Colorado River. 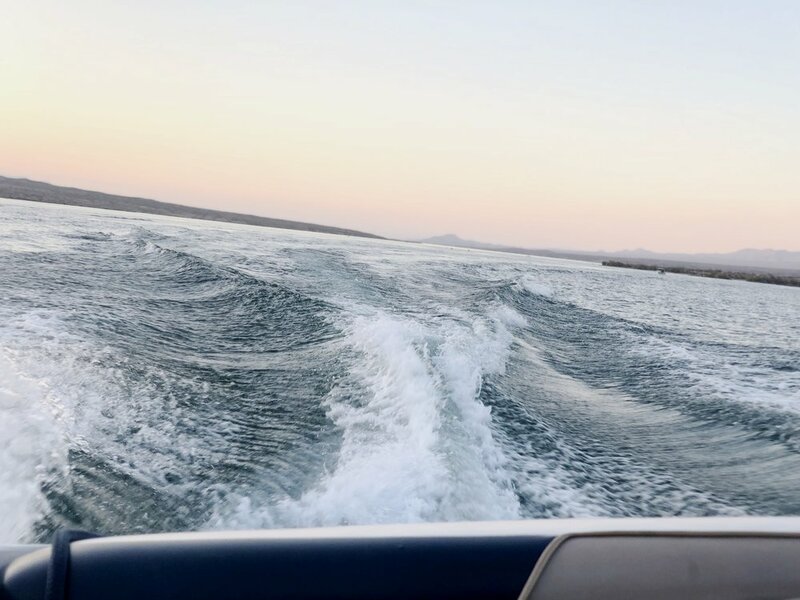 Our friend Laurie who's been enjoying the Mohave Lake since childhood! close enough to drive back home if an emergency occurred, but far away to feel the joy of being on family vacation-mode. The trip was so, so fun. 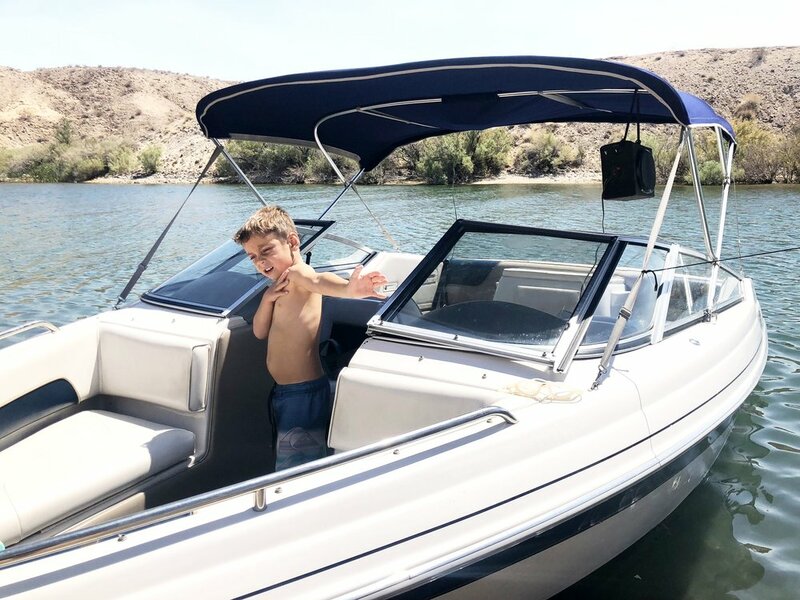 We hung out at Lake Mohave for two straight days-- cruising on our friends' boat, swimming for hours, enjoying adult beverages and letting the kids eat all the chips, snacks and juice they wanted (we actually had sandwiches, fruit and veggies too). that is very relaxing. For one, there's no internet service in the lake, located in the middle of the desert. That completely removes you from the tendency to check your phone every few minutes. Fact: I still don't know how to swim! But life jackets are plentiful. There are even loaners for guests to use before heading out to the lake. which makes you want to stay cool in the water and hug your kids in their adorable little floaties. Toby decided to throw rocks into the lake for about 30 minutes. He laughed every time a rock would hit the water. Benny decided to play good guys v. bad guys using small water guns and exchanged water attacks with his new buddy Andrew. Then he hopped out of the water and joyfully acted as if he lived in, and owned the boat while we hung out in the water. 237 miles of shoreline and nearly 200 sandy beach cove areas that can only be accessed by boat. It's really fun to scope out the different beaches and decide where your crew will settle for the day. you basically mark your territory by parking the boat and setting up your fun zone, which usually includes tents, beach chairs, tables, coolers, water games and water toys. Those seeking bigger water thrills take their Jet Skis and Sea-Doo's. A quick stop in front of this fun mural at a Jerky shop along Route 66 on our way home from Laughlin. and arrive at your accommodations (we stayed at our friends' super comfy house), you've had plenty of fun in the sun and the only thing left to do is rest and relax some more. Then if you have time the next morning, you can head over to Casino drive, enjoy a breakfast buffet and try your luck at a slot machine or Blackjack table before returning to Los Angeles. It's exactly what we did and drove home $30 richer. Lol. It was an overall wonderful escape. Thanks Alex and Laurie! We can't wait to hang out again!